In fact, the SWP-UAF has defended and supported Leftist regimes which murdered tens of millions and imprisoned millions more. As I said, violence and oppression, when done for a good (Leftists) cause, is completely OK to the average Leftist. It's only when the wrong group is committing violence and oppression, and for the wrong reasons, that violence and oppression are wrong. In other words, the SWP-UAF doesn't think that violence and oppression are wrong at all. This is a kind of Marxist relativism. Or, at the very least, Marxist theory somehow makes certain acts of violence (even mass killings) and oppression (even the Gulag) right and justifiable. 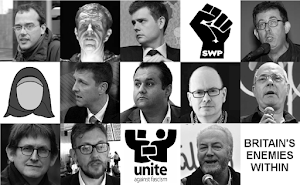 UAF-SWP didn't have anything to say about the ex-Al-Muhajiroun invitee either. I think hypocrisy is the word.